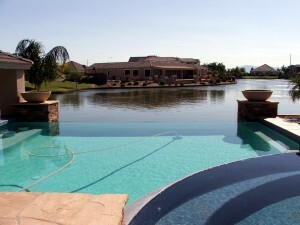 Pinelake Estates is a newer luxury community in 85249. This lavish contemporary lake community is close to the 202 freeway and near everything to do in Chandler, including Chandler Fashion Center. Luxury Homes in Pinelake Estates range from 2,600 sq.ft. to over 5,000 sq.ft. The grand luxury homes in this community are build by leading builders, such as: Continental, Schuler, Shea, and Trend.